Christmas baking around here is more seat-of-the-pants and less ambitious than at Caroline’s, but we do bake some things every season to give as gifts to our children’s beloved teachers, principle, and school staff. Also, we live in a really lovely, diverse neighborhood, with many childless couples, older couples, older single people, and young families, and Ella has a made a point of delivering cards and cookies to those we know best every year. It’s a tradition she started, and which makes me really proud of her. This year, something possessed me to add caramels to our batch of cookies. I’m not sure what transpired or why our more traditional plans got hijacked, but I found myself one afternoon doing some cooking science with the kids and whipping up a batch of these Fleur de Sel Caramels. 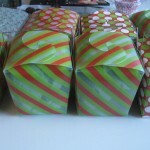 They were totally delicious, and aside from the tedium of wrapping each by hand, very fast and easy to make. The one problem is that they were too soft, and while they were stable at room temperature, they were better stored in the refrigerator. I figured they’d be even better coated in bittersweet chocolate and coated with more fleur de sel. Which they were. I strongly encourage you to try it. It’s fun, a little messy,and totally delicious. The trick was figuring out how to temper chocolate, which can be a tricky and time consuming process. But first time was charm, and soon Kory and I were dipping and swirling those caramels in a dark, sweet chocolate that had just the right gloss, sheen, and snap. 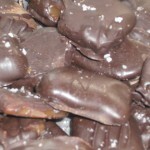 We gave some of those caramels away, but we kept a good batch for ourselves. Sadly, all we have left is this picture. But they have entered a permanent place in our holiday repertoire. To temper your own chocolate I’d strongly advise not just following my lead, but reading here and here. Basically, to temper your chocolate you must slowly (SLOWLY) heat 2/3 of your finely chopped chocolate in a double boiler, then when the chocolate reaches about 105 degrees, take it off the heat and add the remaining 1/3 (also finely chopped chocloate). Then, stir, stir, stir, stir, until the chocolate reaches 88-90 degrees, at which point it should be tempered. This can take a long time. You can tell partly by the consistency, which is quite viscous and sticky.